Britain's Prince Harry, who is sixth in line to the throne, and American Meghan Markle, who is best known for her former role in the TV drama Suits, are due to marry this Saturday in Windsor, England. For many fans, it is a fairy-tale romance and Meghan breaks the mold of the demure princess, says British royal expert Richard Fitzwilliams. "Meghan is an American biracial divorcee who is an activist, a feminist and former actress. Those were credentials that might well have barred her from marrying a senior member of the royal family only a relatively short time ago. Now they are being positively welcomed," he said. In Britain, the day has added significance for many who watched a 12-year-old Harry grieve at the funeral of his mother, Princess Diana. The prince, now 33, cites her as his inspiration for the charitable work that he and Meghan will continue as a couple. 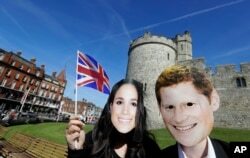 People wearing face masks of Britain's Prince Harry and Meghan Markle pose for a photograph outside Windsor Castle in Windsor, England, May 14, 2018. "She's been an activist for much of her life," Fitzwilliams said of Meghan. "This is taking the role to a new level and she can lobby at the very top." However, that lobbying has a limit. Some fear Meghan's outspoken nature may not go over well in the gilded corridors of a royal dynasty where politics is taboo. "The royal family does things quietly, with dignity," said Thomas Mace-Archer-Mills, a self-styled royal obsessive and founder of the British Monarchist Society, "and that's what we count on them for. So it's going to be very difficult for her to really curtail her activism. And we've seen a few stumbles here and there as she's been acclimating to royal life." Meghan and Harry met in 2016, reportedly in Canada, although the full details surrounding their early romance remain hazy. The couple announced their engagement last November in the gardens of London's Kensington Palace, where Harry was raised by Diana and Prince Charles, alongside his older brother, William. For Britons, the wedding will mark a particularly happy milestone for Harry, said Fitzwilliams. "This will be the royal wild child who has developed beyond levels that perhaps we thought he would." 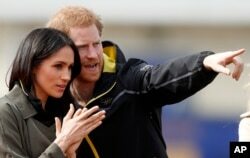 FILE - Britain's Prince Harry and his fiancee, Meghan Markle, attend the UK team trials for the Invictus Games Sydney 2018 at the University of Bath in Bath, England, April 6, 2018. The death of Princess Diana in a Paris car crash scarred a nation and deprived two young boys of their devoted mother. In recent years, Harry has described the mental trauma of the funeral. "It was an extraordinary experience," Fitzwilliams said. "There is no doubt that he's had some deeply troubling times. The army has made him, and also it's very important to remember his commitment to charity." Those twin passions have seen Harry serve in Afghanistan and champion charitable causes around the world, including the Sentebale charity for young people affected by AIDS and the Invictus Games for wounded servicemen and women. Both he and Meghan have spoken of their desire to build on that work. While it may take some time for Meghan to adjust to life in the royal family, she's already laying down a few domestic ground rules, according to Mace-Archer-Mills. "She's brought a California lifestyle to Britain," he said. "She's slimming him down, she's putting him on [diet of] shakes, eating less meat. What Brit do you know that doesn't like meat?" It is the tale of the royal wild child tamed by the American star. While millions will tune in for the wedding, many more will watch with fascination in the coming years as the new couple make their way in the world.